Intramedullary dermoid cyst is a rare entity. It is usually associated with spinal dysraphism and dermal sinus. Our case is an 18-months-old female child who presented with history of fever and mild difficulty in moving left leg. She had a sinus in mid dorsal spine since birth with history of intermittent discharge from it. On magnetic resonance imaging of spine she was diagnosed to have large intramedullary epidermoid/dermoid cyst in the D2-7 vertebral level with a sinus tract. A dermoid cyst along with the sinus tract was excised. Post-operative follow up period was uneventful with full recovery. The incidence of intramedullary tumors of the spinal cord is 2-4% of all central nervous system tumors. Intraspinal dermoid cysts are less than 1% in incidence, commonly seen in extradural location in lumbar area. They are usually associated with either lumbar spinal dysraphism or a dermal sinus tract. Intramedullary dermoid cyst is extremely rare and only a few cases were reported. They present usually very late with significant neurological compromise. 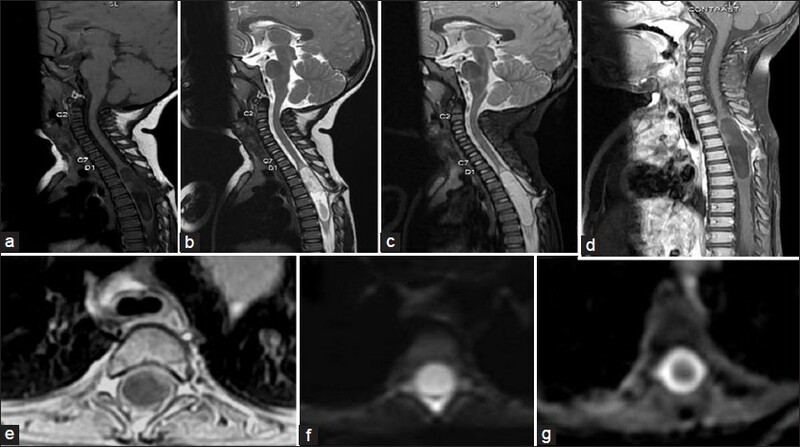 We report a case of large intramedullary dermoid cyst of the spinal cord associated with a dermal sinus in mid-dorsal-spine in an 18-months-old female child presenting early with fever due to intermittent sinus discharge and infection. An eighteen-months-old female child presented with history of mild fever and intermittent discharge from a sinus in the mid-dorsal area. On examination, she was febrile with normal power and sensation in all limbs except mild stiffness of left leg. Posterior aspect of mid-dorsal spine (D 5 ) shows a skin dimple with no active discharge at presentation [Figure 1]. Magnetic resonance imaging (MRI) of whole spine revealed a large intramedullary cystic lesion in the dorsal segment of spinal cord extending from D2 to D7 vertebral level with single posterior sinus tract opening to skin at D5 vertebral level. The cystic lesion shows T1-weighted (T1W) hypointense, T2-weighted (T2W) and short tau inversion recovery (STIR) hyperintense signal, restricted diffusion in diffusion-weighted image (DWI) and apparent diffusion coefficient (ADC) image. Small T1W isointense and T2W hypointense content noted inside the cystic lesion. No fat signal was seen inside the mass. Post-contrast MRI image shows no enhancement of the lesion [Figure 2]. Intramedullary spinal epidermoid/dermoid with posterior sinus tract was given as possible radiological differential. Dorsal D 1 to D 8 laminectomy was done. Mid-line myelotomy and total tumor excision under microscope was done. Injection methyl prednisolone was given as bolus dose (30 mg/kg body weight) during intra operative period and continued for 24 hour in post-operative period with a dose of 5.4 mg/kg body weight. Tuft of hair and cheesy material with a thin capsule were removed in piece meal; portion of the capsule could not be removed as it was densely adhered to the cord. Dermal sinus tract was ending within the dermoid capsule [Figure 3] and was also excised. Myelotomy was left open and water tight dural closure was done. Post operatively she developed mild weakness of left lower limb (grade-IV power) which she recovered by 10 th post-operative day. She was discharged free of neurological deficit. 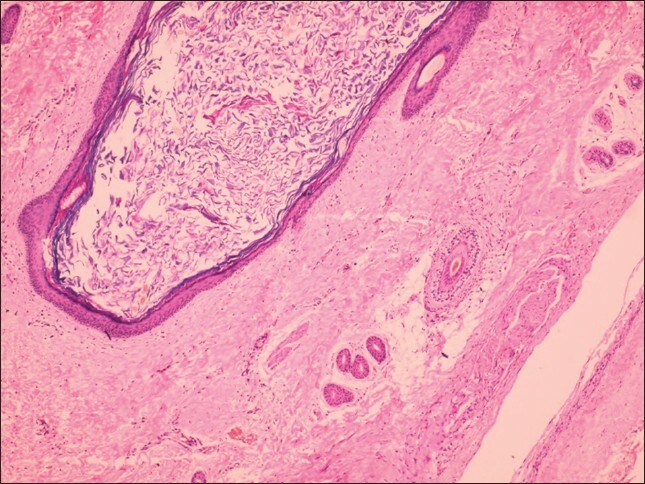 The histopathological diagnosis of the lesion confirmed dermoid cyst [Figure 4]. The appearance of dermoid cyst on MRI is variable, sometimes showing high signal intensity on T1-weighted images (T1W), but more commonly having low to intermediate signal intensity on T1-weighted images and high signal intensity on T2-weighted images (T2W). The lack of a fatty signal may be a result of secretions from sweat glands within the tumor causing increased water content. Dermoid shows diffusion restriction and no post-contrast enhancement unless they are infected like epidermoid. Infection is more common in association with sinus track. T1-weighted images with wide window settings best show the sub-cutaneous portion of the sinus tracts, whereas T2-weighted images show the sinus tract as a hypointense linear or curvilinear structure. In our case the dermoid shows predominant T1 hypointense, T2W/STIR heterogeneously hyperintense signal and diffusion restriction with T2W hypointense sinus track. 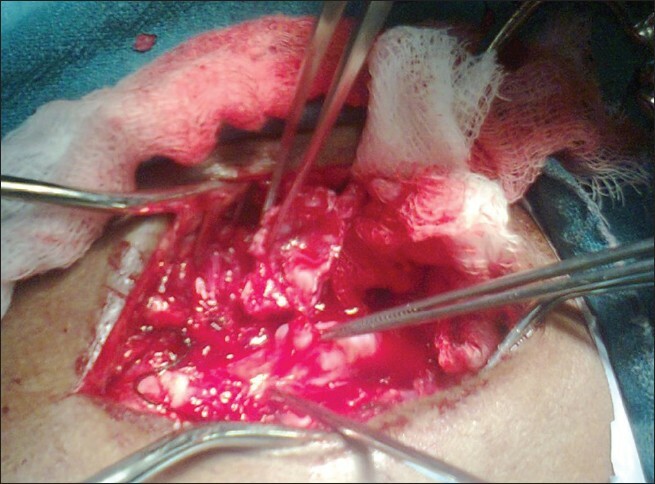 Total microsurgical excision of dermoid cyst along with the capsule is the treatment of choice. Partial excision of dermoid cyst wall with decompression in case of dense adhesion of lesion with spinal cord also gives good clinical outcome. In our case, the whole of the dermoid cyst along with the sinus tract was excised except small portion of capsule which was attached firmly to the spinal cord. Dermal sinus in mid-dorsal spine associated with a large intramedullary dermoid cyst presenting only with intermittent fever, sinus discharge and subtle neurological deficit are rare. Patient with dermal sinus should be evaluated early with spinal imaging preferably by MRI of spine to rule out underlying spinal cord lesion which will facilitate better treatment at the early stage of disease, thus preventing development of neurological deficit. 1. Kane PJ, el-Mahdy W, Singh A, Powell MP, Crockard HA. Spinal intradural tumours: Part II-Intramedullary. Br J Neurosurg 1999;13:558-63. 2. Najjar MW, Kusske JA, Hasso AN. Dorsal intramedullary dermoids. Neurosurg Rev 2005;28:320-5. 3. Barsi P, Kenez J, Varallyay G, Gergely L. Unusual origin of free subarachnoid fat drops: A ruptured spinal dermoid tumour. Neuroradiology 1992;34:343-4. 4. Steinbok P, Cochrane DD, Poskitt K. Intramedullary spinal cord tumors in children. Neurosurg Clin N Am 1992;3:931-45. 5. Netsky MG. Epidermoid tumors. Review of the literature. Surg Neurol 1988;29:477-83. 6. Gormley WB, Tomecek FJ, Qureshi N, Malik GM. Craniocerebral epidermoid and dermoid tumors: A review of 32 cases. Acta Neurochir (Wien) 1994;128:115-21. 7. Dias M, Walker ML. The embryogenesis of complex dysraphic malformations: A disorder of gastrulation? Pediatr Neurosurg 1992;18:229-53. 8. Maiuri F, Gangemi M, Cavallo LM, De Divitiis E. Dysembryogenetic spinal tumours in adults without dysraphism. Br J Neurosurg 2003;17:234-8. 9. Barkovich AJ. Pediatric neuroimaging: 4 th ed Philadelphia:. Lippincott Williams and Wilkins; 2005. p. 717-8, 757-8. 10. Lunardi P, Missori P, Gagliardi FM, Fortuna A. Long term results of the surgical treatment of spinal dermoid and epidermoid tumors. Neurosurgery 1989;25:860-4.